Remember that car that was broken into and the gun was stolen outside of that "No Guns Allowed" restaurant? The one where criminals hide and watch because they know citizens follow the law? Ya, I'm sure it probably came from there. That's our law makers keeping up safe! Natural selection at it's finest. Play stupid games, win stupid prizes..
Would I have involved myself into something so foolish? Pity, reserved for the family only...for the dopey kid, none. It is really sad that kids today think they are invincible. They have no concept of their mortality and a significant reduction in their morality. Mueller wants 25 blank subpoenas to investigate the Russian connection to Trump. It is sad, kids today are constantly numbed towards life and mortality even further with all that goes on in their tiny little bubbles. I bet however the other kids involved in this are WELL aware of mortality. Kids lacking an understanding of their own mortality is nothing new. I distinctly remember being immortal and invulnerable. Late teens and early twenties especially, 1960s & 70s. I'm raising my boys with a thorough understanding of risk analysis and the rules of stupid. We were once young and bullet proof but we still had 100 times more common sense than they do today! And I work at a Texas Public School! I don't think I ever thought I was invincible when I was in my teens but of course my generation was one of the last that grew up in a time before you could "Load Saved Game". I sometimes wonder if modern kids forget that in real life you cannot go back to the last save point. Interesting, Noggin. Do you think this is individual or more an expression of cultural differences between our native countries? I did not see a video game until I was attending the US Army's Field Artillery Officer Advanced Course in 1981. I wonder how much their decision making was impaired by recreational drugs? If I were dictator, one of the first things I would do is publicize the involvement of drugs in every crime. I'm sad for the family. I can rmember playing pong in an arcade back in 73 and Space Invaders built into a table in a Pub in 79 but I think the first time I ever played on an early primitive home console was in 81. The UK Army was very slow into introduce computers. The Royal Artillery had their FACE system back in the 70s see below. Also the Army Pay Corps had and IBM based payroll system but that was just about all there was back then. In the 80s PCs began to appear in ad hoc standalone roles but it was not until the 90s that proper network systems began to appear. No sympathy for the self inflicted . . . The UK Army was very slow into introduce computers. 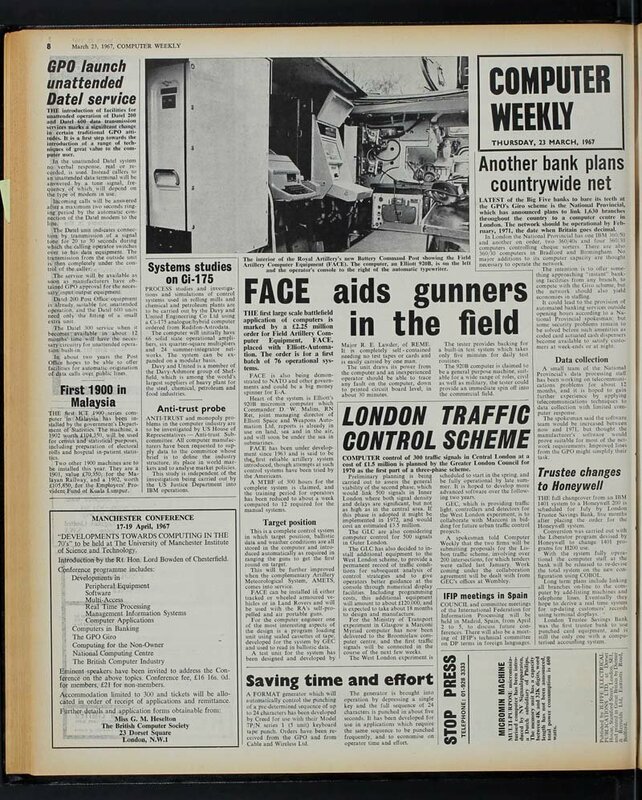 The Royal Artillery had their FACE system back in the 70s see below.
. . . but the date shows 1967?